The Office of Commission Affairs staffs the Planning Commission and the Historic Preservation Commission. In addition, as the Custodian of Records, the office responds to record requests under the Sunshine Ordinance submitted to the department. Hearings are presented live online and television on the day and time of hearing and re-broadcast on television the following day. 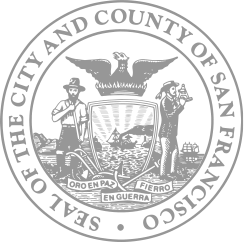 Commission hearings are held in Room 400 at City Hall, 1 Dr. Carlton B. Goodlett Place in San Francisco. City Hall is open to the public Monday through Friday from 8:00 a.m. to 8:00 p.m. and is accessible to persons using wheelchairs and other assistive mobility devices. Ramps are available at the Grove, Van Ness and McAllister entrances. A wheelchair lift is available at the Polk Street entrance. Disability Accommodations: To request assistive listening devices, sign language interpreters, readers, large print agendas or other accommodations, please contact the Commission Secretary (415) 558-6309 or commissions.secretary@fgov.org at least 48 hours in advance of the hearing. To request an interpreter for a specific item during the hearing, please contact the Commission Secretary at (415) 558-6309, or commissions.secretary@sfgov.org at least 48 hours in advance of the hearing. ENGLISH: To request an interpreter for a specific item during the hearing, please contact the Commission Secretary at (415) 558-6309, or commissions.secretary@fgov.org at least 48 hours in advance of the hearing. SPANISH: Si desea asistir a la audiencia, y quisiera obtener información en Español o solicitar un aparato para asistencia auditiva, llame al 415-558-6309. Por favor llame por lo menos 48 horas de anticipación a la audiencia. TAGALOG: Para sa tulong sa lengguwahe o para humiling ng Pantulong na Kagamitan para sa Pagdinig (headset), mangyari lamang na tumawag sa 415-558-6309. Mangyaring tumawag nang maaga (kung maaari ay 48 oras) bago sa araw ng Pagdinig. RUSSIAN: За помощью переводчика или за вспомогательным слуховым устройством на время слушаний обращайтесь по номеру 415-558-6309. Запросы должны делаться минимум за 48 часов до начала слушания. Government's duty is to serve the public, reaching its decisions in full view of the public. Commissions, boards, councils and other agencies of the City and County exist to conduct the people's business. This ordinance assures that deliberations are conducted before the people and that City operations are open to the people's review. Members of the public are not required to provide personal identifying information when they communicate with the Commission or the Department. All written or oral communications, including submitted personal contact information, may be made available to the public for inspection and copying upon request and may appear on the Department’s website or in other public documents. For more information on your rights under the Sunshine Ordinance (Chapter 67 of the San Francisco Administrative Code) or to report a violation of the ordinance, contact the Sunshine Ordinance Task Force at City Hall, 1 Dr. Carlton B. Goodlett Place, Room 244; phone (415) 554-7724; fax (415) 554-5163; or e-mail at sotf@sfgov.org. Copies of the Sunshine Ordinance can be obtained from the Clerk of the Sunshine Task Force, the San Francisco Library and on the City’s website at www.sfbos.org/sunshine. Individuals and entities that influence or attempt to influence local legislative or administrative action may be required by the San Francisco Lobbyist Ordinance [SF Campaign and Governmental Conduct Code Section 21.00-2.160] to register and report lobbying activity. For more information about the Lobbyist Ordinance, please contact the San Francisco Ethics Commission at 25 Van Ness Avenue, Suite 220, San Francisco, CA 94102; phone (415) 252-3100; fax (415) 252-3112; and online http://www.sfgov.org/ethics.